The Bangi Field Station (hereafter Bangi FS) is on the 4th floor of the Institute of the Malay World and Civilization (ATMA) of Malaysian National University(UKM). Bangi FS is being used as a base for on-site research and education in Malaysia and Singapore for ASAFAS and CSEAS students and faculty members and as a place for scholarly exchange between UKM and ASAFAS, CSEAS. 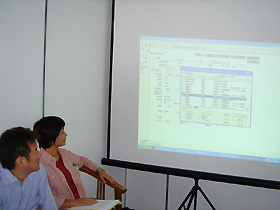 In FY2004, in addition to equipment for research such as a computer, printer and scanner, the Field Station was equipped with a multimedia projector and a screen for use in reporting on research so that it would be able to serve as a base for group study sessions and meetings for presenting research reports. Bangi FS provides research support for ASAFAS graduate students as one of the pillars of its activities. This fiscal year, as last year, three graduate students were engaged in on-site research and literature research with Bangi FS as their base. One of them is receiving funding from the 21st Century COE Program. Each of the students received advice on research from faculty members of ATMA and other institutes of UKM. They also discussed their respective research themes and methods of on-site research and literature research with graduate students and young faculty members of UKM. Another graduate student was conducting on-site research in Singapore with funding from the 21st Century COE Program. An outline of the four students' research is as follows. 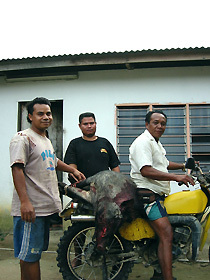 The New Economic Policy introduced in 1971 by the Malaysian federal governmentgives preferential socio-economic treatment to ethnic Malays and indigenous peoples, the so-called "Bumi Putri Policy." KAWANO is conducting research in Malay villages and fishing ports on how technical innovations in fishing and deep-sea fishing in Terengganu State on Malaysia's east coast have been promoted and how marine products distributors and small-scale fishing people were adapting to the fishery modernization policies. 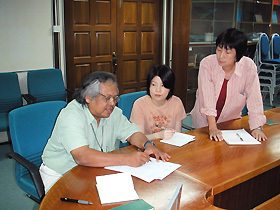 NAITO studied the literature at the Forestry Department of Peninsular Malaysia and NGOs on the forest certification system implemented in Malaysia from the latter half of the 1990s, a system that gives certification recognizing sustainable forest management according to a certain standard and that promotes lumber production based on that certification. At the same time he conducted a preliminary survey in a village of indigenous people, generally referred to as "Orang Asli," in Negeri Sembilian State on how the Orang Asli, who depend for their livelihood on hunting and gathering in the forest, regard the forest certification system. 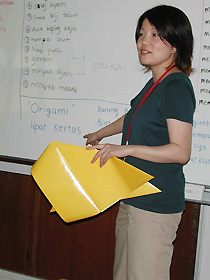 TAKAHASHI studied the literature on changes in language education in Singapore and the present situation of English education. At the same time she interviewed mainly ethnic Chinese women living in public housing in the Ang Mo Koi district of Singapore about the co-relation between disparities in generation, schooling and standard of living and changes in the use of language. 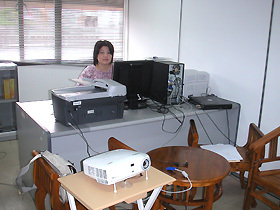 In January 2005 NAGATSU Kazufumi visited the Bangi FS and conducted study meetings with KAWANO Motoko and KATO Yuko on on-site research data management. Besides explaining how to create a rural village socio-economic database and village maps using such software as FileMaker and Illustrator, NAGATSU advised them on how to collect development administration materials at the village level. NAGATSU, along with KAWANO and KATO, visited Hulu Langat, the Minangkabau-Malay village in Selangor State that is KATO's research site and heard from her host family about their history of migration and changes in medical practices, including childbirth. 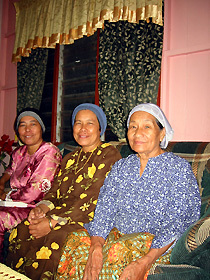 From their observations and interviews in Hulu Langat, the three discussed the interconnectedness of changes in medical practices in the village and the macro political-context, such as the penetration of the New Economic Policy, the spread of the Islamic Revival Movement and the improvement of the health care system. The three also visited an Orang Asli village in Selangor and heard from the villagers about the state of health care facilities there. 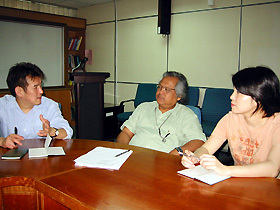 NAGATSU, KAWANO and KATO also held a study meeting with Prof. Shamsul of ATMA on local administrative systems in Malyasia. At the meeting they were given a lecture by Prof. Shamsul on how to investigate Malaysian administrative systems. In February KATO Tsuyoshi visited the Bangi FS and conducted on-site education with KAWANO Motoko and KATO Yuko. He discussed with KAWANO how small-scale fishing people in Terengganu State maintain their livelihood and pointed out the need for pursuing in concrete terms the historical process of its continuity and change, given the economic relationships on various levels, from mutual aid on the village level to development assistance to small-scale fishing people by government bodies. 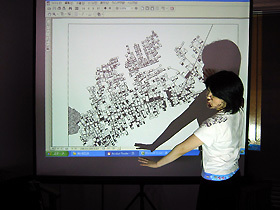 He advised KATO Yuko to learn the ethnic descent and economic base of political leaders on the village and parish levels at an early stage of her research. The digitalization of the following resources is underway at the Bangi FS. These electronic data will be made released on the Bangi FS Website (for university use only) due to be put up in the next fiscal year and will also be provided to the ATMA portal site PADAT (Malay World Studies Database). ASAFAS graduate students KAWANO Motoko and KATO Yuko were instrumental in organizing a series of workshops at the Bangi FS on January 20, February 14 and March 14, "Reviewing Malaysia Studies through Experiences. 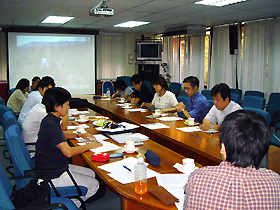 The purpose of the workshops was for young Japanese researchers carrying out on-site research in Malaysia in the same period to report on the progress of their research and discuss academic and technical problems that they faced in the field. Between 10 and 15 graduate students and researchers from Japan studying at, or affiliated with institutions such as UKM, University of Malaya and International Islamic University Malaysia, attended the each workshop. 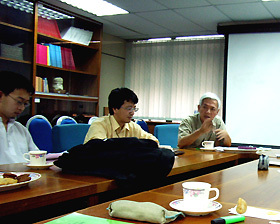 Lively discussions were held on matters like methods of on-site research and historical material research in Malaysian studies, possibilities for interdisciplinary joint work, the prospects for comparative studies in various areas of Malaysia or with areas bordering on Malaysia, the appeal of Malaysian studies, which has been said to be less interesting than area studies of other regions of Southeast Asia. The purpose of the workshops and the program can be found at the following Website (in Japanese). The workshop series held this fiscal year was significant as a forum where Japanese researchers conducting research in Malaysia around the same time can exchange the findings of their research across disciplinary boundaries and exchange information on Malaysian research. 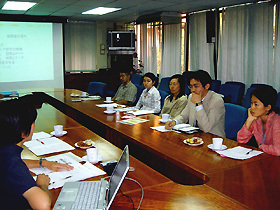 We are considering organizing the same kind of workshops in FY2005. Needless to say, however, it is necessary to organize joint study meetings for Japanese graduate students and young researchers to report the results of their study outcomes to Malaysian researchers and to learn from the latter in turn. 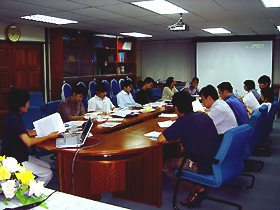 In FY2005 we are planning to organize such study meetings or workshops together with young researchers from ATMA and other graduate schools.